Contact the owner @ 405-550-7685...Possibly one of a kind. 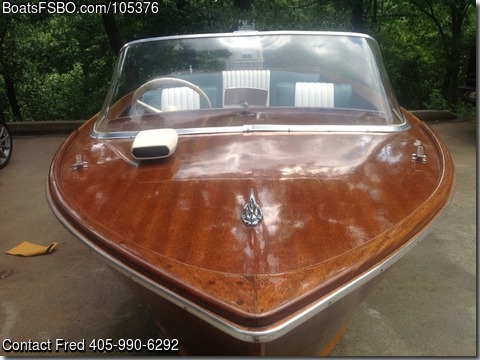 Beautiful African Mahogany, original reliable engine, excellent interior, family owned since 1967, current owner since 1978. Never outside overnight since 1994. Best Outboard award winner in Missouri, Oklahoma, and Texas boat shows. New wheels, hubs, and tires and mooring cover. Current OK registration, boat motor titles. Original owners manual. 1984 factory document praising condition as one of a kind. 41 years in my hands. Hate to part with it but it is time to downsize. Not a fishing boat but a beautiful boat to cruise the lakes. A showstopper on the water.